Our Mission: To provide the finest quality home gardening tips, growing information, trivia and garden resources, from seed starting to growing, harvesting, storing and eating the flowers, fruits, herbs, and vegetables of our gardening labor. The Gardener's Network is the perfect place for you and your plants, the perfect source on how to grow just about any plant! 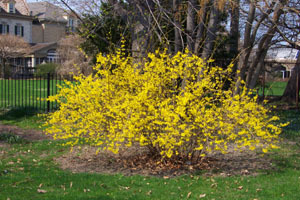 Forsythias are one of spring's earliest blooming bush. Attractive and easy to grow. More on Forsythia bushes. Top Ten Gardening Tips for April Our newest category offers you gardening tips each month. Grab a garden tip to use this month. See April Garden Tips. A Garden Encyclopedia We strive to provide the most in-depth how to grow guide sheets and information. While it's cold and snowy outdoors, learn a few tips and techniques for growing better vegetables, flowers, herbs, organics, or a favorite heirloom. Our fact sheets will help you to have the best garden you can grow. Indoor Plant Starts - Starting seeds indoors to transplant later, is one of the early joys of gardening. Why let the garden stores have all the fun, when you can start your own seedlings!? It's time to review the basics of seed starting, and seedling care. As a rule of thumb, most indoor planting starts should be planted six to eight weeks before the last frost in your area. Hot Peppers are getting hotter and hotter every year. Ghost Peppers, the hottest hot pepper on the planet just a few years ago, now barely makes the top ten list. Find the Top 10 Hot Peppers in the world! Organic gardening is healthy and growing. Perhaps one of the reasons you grow your own herbs and vegetables is to produce healthier food for you and your family. Even if you're not an organic gardening purist, there are a lot of easy to use organic gardening tips to make the food you eat even healthier for you! Today's Gardening Deep Thought: "Sow generously, and you will reap generously." Top 10 Signs You've Gone over the Garden's Edge- How avid a gardener are you? Gardening Holidays - A reason to celebrate! The Gardener's Network is your gardening community. It's a place for home gardeners to learn about gardening, ask questions, contribute gardening tips, ideas, and garden humor. 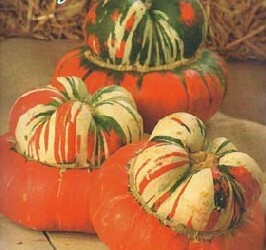 Garden Blog Come and talk about plants and gardening with gardeners just like you. Join the fun. Share a picture, share some knowledge. Follow us on Facebook - Keep current with the latest gardening news, fun, facts, trivia and more. Don't miss another day!